The homeowner with under $200 dollars to spend on a new toilet might expect their choices to be very limited. You’d be surprised. There are some really classy designs available in this price range and the flushing systems are efficient and effective. We have reviewed some of the best toilets available for under $200. 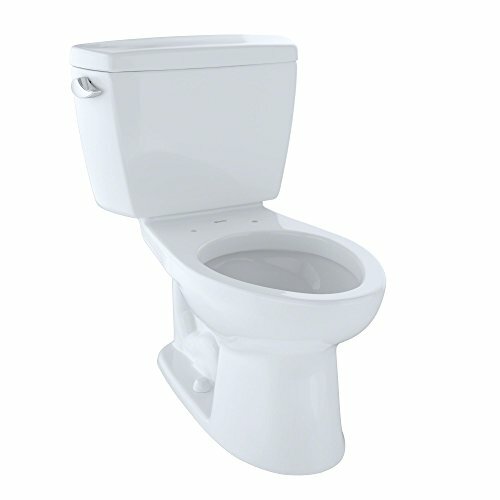 It is equipped with a pilot-operated fill valve that ensures a quiet flush. It has a clean shut-off, whatever the water pressure. The manufacturer offers a limited lifetime warranty on the China components, and a one-year limited warranty on the tank trim. The Dual-Max flushing system allows the user to choose a full or a partial flush, using 1.6 or 0.9 GPF, respectively. This toilet boasts Kohler’s Class Five flushing system, designed to clean toilets in both commercial and residential settings. The toilet has a triple-action jet flush that ensures the toilet bowel is properly cleaned with every flush. The toilet is equipped with dual flush, which allows the user to select the magnitude of the flush, saving water. At under $200, this TOTO toilet is great value for money. The two-piece cotton toilet has a close-coupled cistern, making it easier to keep clean. The high-profile tank is equipped with a chrome-plated flush lever mounted on the side of the tank. The Universal height toilet is ADA-compliant and has a comfortable elongated bowl. The seat is excluded. The toilet boasts the E-Max flushing system, which uses just 1.28 gallons of water per flush (GPF). The E-Max system uses the same technology as the G-Max, but has been re-engineered to use less water. Like the G-Max, the E-Max has a three-inch flush valve, which is 125% bigger than the standard two-inch valve. This is paired with a large glazed trapway and a large siphon jet that ensures that waste is efficiently removed. It is equipped with a pilot-operated fill valve that ensures a quiet flush. It has a clean shut-off, whatever the water pressure. This combination of features ensures a powerful yet quiet flush that leaves the bowl spotless. This toilet really comes in at a bargain basement price and it looks good, too. It is a two-piece, bright white toilet with a high-profile tank. This classic design has a front-mounted flush lever of chrome-plated plastic. The bowl and tank are vitreous china. The bowl is elongated for a more comfortable seat. The smart flush technology uses just 1.6 GPF. The flush system has a two-inch glazed trapway. The installation kit contains a smart fasten tank-to-bowl connection that uses just three bolts. The toilet seat and supply line are not included. The manufacturer offers a limited lifetime warranty on the China components, and a one-year limited warranty on the tank trim. This wall-mounted toilet in cotton white has nice sleek lines, which make it very easy to keep clean. It is a universal height with an elongated seat. It can be paired with the TOTO in-wall tank system or with other in-wall tank systems. The Dual-Max flushing system allows the user to choose a full or a partial flush, using 1.6 or 0.9 GPF, respectively. This CalGreen-compliant toilet is sold without the seat. This two-piece toilet has a round bowl making it an ideal choice for smaller bathrooms. It has a classic design but with an unusual tulip-shaped tank which gives it an exclusive look. The nested trip lever allows the user to select either full or partial flush, using 1.6 or 1.1 GPF. This toilet boasts Kohler’s Class Five flushing system, designed to clean toilets in both commercial and residential settings. It has a 3.25 flush valve to ensure that the water rushes into the bowl with force. The large trapway maximises the momentum of the water. The toilet comes with the exclusive DryLock system for easy installation. This WaterSense approved product has a limited one-year warranty. This lightweight toilet has been designed for use in campers and RVs. It has a full seat and is standard height so the user will not be inconvenienced when away from home. The toilet has a triple-action jet flush that ensures the toilet bowel is properly cleaned with every flush. The flush is actuated by a foot pedal. The toilet is also equipped with a watertight flush ball system so that the water stays in the bowl and odours are kept in the holding tank. This toilet can replace any toilet fitted in an RV, but an adapter kit may be required. This wall-mounted toilet has a modern look with a smooth sleek finish, making it easy to keep clean. It has a large elongated bowl for comfort. The required in-wall tank, carrier and activation plate are not included in the pack, and neither is the seat. The trip lever is included, however. The toilet is equipped with dual flush, which allows the user to select the magnitude of the flush, saving water. This washdown toilet uses 1.6 GPF. It has a limited lifetime warranty. This toilet comes in at just under $200, but its design makes a statement. It has a modern clean design with a skirted bowl that has no crevices or grooves to harbour dirt or bacteria, making it a breeze to keep clean. The seat and tank are not included in the purchase. The toilet can be upgraded by adding the SensoWash Starck shower toilet seat. This seat is something special. The lid and seat are power activated. It has rear and front washes with individual adjustments for the water temperature and pressure. Air dry and seat temperature settings are also adjustable. It has a night-light and self-cleaning wand, and is programmable for two users. The seat is also easy to remove and replace for effortless cleaning. The siphonic flush system uses just 1.28 GPF. The toilet is WaterSense-certified. A buyer with a budget of less than $200 does not need to compromise on style or quality, as there is a range of high-quality toilets from top manufacturers available to purchase in this price range.